Jenna has extensive experience representing buyers, sellers, lenders and developers in a wide variety of commercial real estate transactions. She advises clients in the negotiation and structuring of the deal, performing due diligence, drafting and reviewing loan and closing documentation, and handling the closing. Jenna also represents landlords and tenants in drafting and negotiating commercial leases for office, retail, mixed-use, and industrial space. 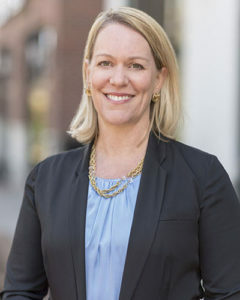 Her experience includes a broad range of development projects, including shopping centers, mixed-use buildings, residential subdivisions, pharmaceutical plants, multi-family housing, office parks, assisted living facilities, low-income housing projects involving tax credit financing, restaurants, and breweries. In connection with her real estate representation, Jenna handles general corporate matters, including formation, organization and governance of entities. Prior to joining Longleaf Law Partners (formerly Morris Russell Eagle & Worley, PLLC), Jenna practiced with The Carson Law Firm and with the Real Estate Development Practice Group of Womble Carlyle Sandridge & Rice, PLLC. She also practiced with several other law firms in the Triangle area.